You just can't beat Black Friday for deals! I've been searching the web to find you the best deals for homeschoolers. Find a deal below that you like just click the image to go to it. I'll be updating this post as I find more amazing deals so don't forget to check back! All Craftsy classes are $15 (USD) or less! These courses make wonderful home economics classes, fine arts or just plain fun to learn. Click here to see all the classes available. Save up to 70% on Crafting Supplies at Craftsy. Little Passports is a cool way to teach your children about geography and how people live around the world. Each month your child receives a new package loaded with fun. They also have kits for kids who love science, and early history. 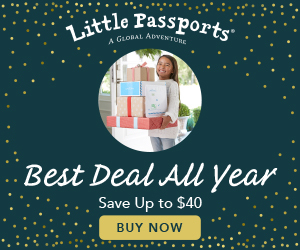 Check out the deal on Little Passports here. Save 62% off your membership to ABC Mouse. Learning language arts isn’t limited to workbooks! SchoolhouseTeachers.com offers courses like Ditch the Desk and Benjamin Franklin Writing Method to take your literacy instruction to a new level! Join during the Fall Harvest Special to try lapbooking, enjoy books from family reading lists, and learn about the Charlotte Mason teaching method. Get access to 400+ preK-12 courses, 10 full libraries of World Book Online, 12 focused learning centers (including one for literacy), and support through our Members Forum and Facebook Community group. Coupon code FALLGIFTS locks in a discounted rate of $139/yr. for the life of your membership — PLUS receive a tote bag (colors vary) and three fall print back issues of The Old Schoolhouse® Magazine for FREE! This deal gets “squashed” after 11/30/18! Music is such a part of our lives and can really help us prepare for the holidays we want to celebrate throughout the year. Learn about, listen to, and do activities with various songs and music which relate to holidays such as New Year's Day, St. Patrick's Day, the Fourth of July, Veterans Day, Thanksgiving, and Christmas with the online course "Music Lessons for Holidays & Special Days!" Each lesson includes Information about the holiday or special day, Videos of the music to listen to or watch, at least one printable, and an online quiz. Use coupon code THANKS2018 to get 30% off from 11/19-11/26. Maestro Classics is one of my favourite sources for children's audio stories. This Black Friday all audio books with activity booksare only $9.98 + FREE shipping! Available now … six festive Christmas resources that will turn your HOMEschooling into HOLIDAYschooling. With the Ho Ho Homeschool Bundle, you can sneak in some low-prep and fun learning for the holiday season. Learn about Christmas traditions around the World, enjoy Christmas carols, explore a classic Christmas story and delve into an Advent nature study. You’ll even involve your preschoolers with a Christmas unit study just for them. Your four eCourses and 2 eBooks would normally cost over $93, but you can snag them now, bundled all together, for just $37. That’s a 60% saving! But do get it quick. The Ho-Ho Homeschool Bundle is only available until November 26. Save 25% off everything from Nov. 23-26 no coupon needed! See the savings here and make your Advent study easy this year!.